Since 1962, family-owned Stephenson’s Auctioneers and Appraisers has been the most trusted choice for the appraisal and sale of estates, collections and real estate in the tristate area and beyond. Located in Bucks County, Pennsylvania, Stephenson’s is a full-service auction company. Our company has the unique ability to handle the sale of antiques, estate and residential contents, and real estate, while additionally having the special expertise to handle business and commercial liquidations at auction. We hold weekly auctions in our 5,000 square foot, climate controlled gallery and also conduct onsite auctions of real estate and home or business contents. 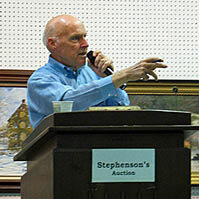 Once per season, Stephenson’s hosts its popular Antiques & Decorative Arts auction. Additionally, several times a year, we conduct specialty auctions that feature collections, e.g., dolls, toys, trains, firearms, books and ephemera, and coins. Stephenson’s is licensed, bonded and insured. Cindy Stephenson is a graduate of the University of Texas with a Bachelor of Arts degree in fine art. 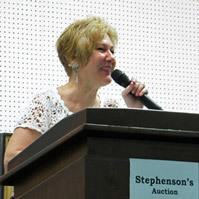 She has been a Pennsylvania licensed auctioneer for over 25 years and conducts weekly auctions year-round at Stephenson's gallery. An International Society of Appraisers (ISA) appraiser since 1992, she is now a Certified Appraiser of Personal Property (ISA CAPP) with specialties in Antiques & Residential Contents, as well as Fine Art. This is the highest level of recognition ISA bestows. Cindy has taken numerous classes on appraising through the ISA and at the Philadelphia Institute on Appraisal Law and Administration, and is current in USPAP (Uniform Standards of Professional Appraisal Practice.) She is a member of the National Auctioneers Association, the Pennsylvania Auctioneers Association, and is active in various professional organizations. 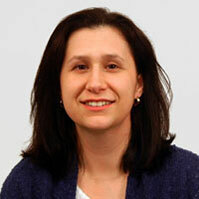 Cindy also holds a Pennsylvania real estate license, as well as a federal and state firearms license. Cindy is available for appraisal work, estate disposition, and auction consultation throughout the country. Tom Wakeley has been a Pennsylvania licensed auctioneer at Stephenson's Auctioneers & Appraisers for more than 25 years. He has extensive knowledge in his specialist fields, as well as in American furniture. He is an accredited jewelry professional with the Gemology Institute of America (GIA AJP). He frequently speaks to community groups, participates in antique appraisal fairs, and offers his auctioneering skills to numerous charity auctions benefiting community organizations. Entrepreneur and business visionary, Robert Stephenson established both R.L. Stephenson Inc. (in 1962) and Stephenson's Auctioneers & Appraisers. 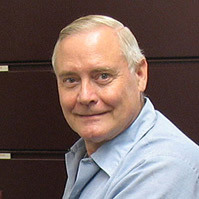 Robert has successfully led our company for over half a century. Still an auctioneer at our weekly gallery auctions, Robert continues to guide our antiques and residential-contents auctions, and our commercial business into the 21st century. Helene Stephenson is an accomplished artist in her own right. 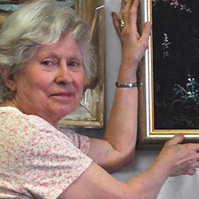 She has won numerous awards, and her work is included in museum permanent collections, as well as corporate and private collections. With a vast personal knowledge of the art world, she serves as Stephenson's Auctioneers' art expert. 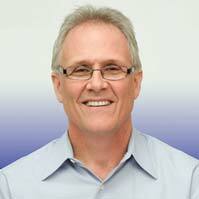 As a retired police lieutenant, Duane Miller manages Stephenson's office with great efficiency. If you have questions about bringing items to auction, Duane can explain our process in its entirety. Duane provides his weapons expertise to the cataloging phase of our firearms auctions. Melissa Hertzler is a graduate of The University of Pittsburgh with a Bachelor of Arts in History. Starting at Stephenson's Auction in 2005, she has worked primarily on the specialty auctions as a photographer, researcher and cataloguer. Melissa has taken several classes in the Appraisal Studies in Fine and Decorative Arts Certificate program through AAA and New York University. Judy Stephenson has been a licensed Pennsylvania auctioneer with Stephenson's Auctioneers & Appraisers for more than 30 years and manages some client calls in New Jersey. 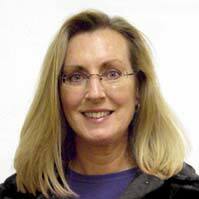 Judy earned her Bachelor degree from Stockton State College in New Jersey. Over the years, she has conducted numerous charity auctions for nonprofit organizations.